Tivoli Theatre in Downers Grove was the first theater purchased and renovated by Classic Cinemas. Willis Johnson grew up just two blocks away from the Tivoli Theatre, a majestic, single-screen motion-picture palace located in downtown Downers Grove. It was at this venerable theater that Willis and his friends spent most of their free time. Even as an adult, he often found himself taking in a movie. “I enjoy the classics, as well as chick flicks,” he says, chuckling. One of his favorites is “Hard Times,” made in 1973, starring Charles Bronson, who plays a drifter who travels to Louisiana during the Great Depression to compete in illegal boxing matches. Another is “The Way We Were,” the 1973 drama featuring Robert Redford and Barbara Streisand. 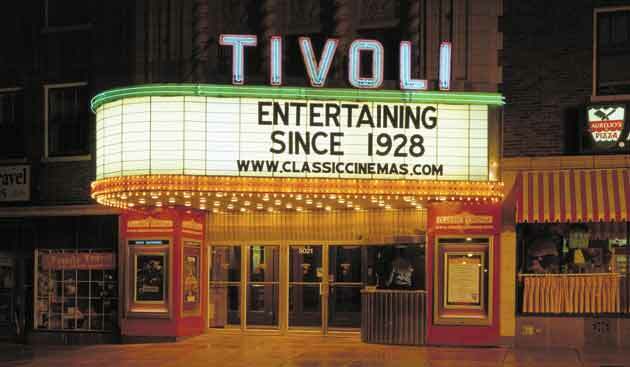 Today, The Tivoli Theatre is fully restored. It plays first-run features and is one of 13 theaters under the banner of Classic Cinemas, a Downers Grove-based business, and the largest independent movie theater company in Illinois. The family-owned business is led by Willis, 74. Shirley, 75, handles special events. Son Chris, 43, who started his career by cleaning out the basement of the Tivoli as a teenager, is vice president of operations. For Willis, who also serves as president of the National Association of Theatre Owners of Illinois, the movie business has always been a labor of love. An early riser, Willis often begins his day by attending a business meeting or community function. He serves on many boards, giving freely of his time and other resources. 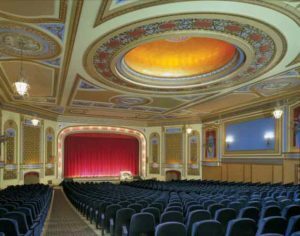 Along with the Tivoli, Classic Cinemas has restored downtown theaters including the York in Elmhurst, the Lake in Oak Park, the Woodstock in Woodstock, the Paramount in Kankakee and the Lindo in Freeport. It has also updated existing theaters and built contemporary theaters, such as the Elk Grove in Elk Grove Village and, most recently, the six-screen North Riverside Mall Theatre in North Riverside. 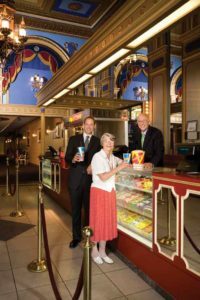 Others in the Classic Cinemas family include the Charlestown 18 in St. Charles; Cinema 12 in Carpentersville; Fox Lake Theatre in Fox Lake; Meadowview Theatre in Kankakee; and Ogden 6 in Naperville. Willis and Shirley Johnson with son Chris at the Tivoli Theatre in Downers Grove. The Tivoli Theatre is typical of most buildings in the Classic Cinemas family. It carries the ambience of its old-time self but has state-of-the-art technology. Over the years, all the theaters in the company have seen major upgrades, from the addition of more and larger screens and Dolby surround stereo sound to 3-D capabilities, wider and more comfortable seats, new carpeting, floor title and wall décor in the auditoriums. Improvements to the lobby and concession areas also have been made. Like parents, the Johnsons attempt to love all of their theaters the same. “But the Tivoli is Willis’s pride and joy,” says Shirley, who grew up in Elmhurst and often attended movies at the York. The Tivoli first opened on Christmas Day 1928 as one of the first theatres in the country built to show “talkies.” Much has changed over the years; today, the Tivoli has Dolby Digital sound and an HPS4000 sound system with the acoustic power of 10 symphony orchestras. The building occupies nearly a block, just north of the Downers Grove train station. Along with the movie theater, it also has a bowling alley, game room, a residential hotel, stores and offices. All of the Classic Cinema theaters, in fact, have their own unique history and charm. The largest is the Charlestown 18 in St. Charles. The Fox Lake Theatre, with its high ceilings, is housed in a space at the Lakewood Shopping Center formerly occupied by a grocery store. In 1986, an Elk Grove resident called WGN radio personality Roy Leonard to complain that there were no theater operators in the village. Classic Cinemas took notice and signed a long-term lease in 1986. The Lake Theatre in Oak Park features many decorative elements brought in from theaters that are no longer standing. The ceiling fixtures in the new lobby rotunda are from the Will Rogers Theatre in Chicago. The art deco wall fixtures were salvaged from the Colonial Theatre in Margeno, prior to its demolition, and other elements were copied from originals. The custom carpet design was replicated from a fragment of the original 1936 flooring found in the building when Classic Cinemas first acquired it. The Woodstock Theatre was purchased in 1988. The movie “Groundhog Day,” a romantic comedy starring Bill Murray, used the theater as a film location. Each year, the theater helps the City of Woodstock celebrate Groundhog’s Day with free screenings of the film. 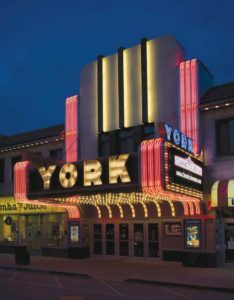 The York Theatre, built in 1924, is Classic Cinema’s second-oldest theater. For theater history buffs, the museum and archives of the Theatre Historical Society of America are located in the building’s second floor. Admission is free to the gallery, which features changing exhibits and artifacts from 15,000 movie theaters from across the country. Each summer, many of the theaters offer a weekly morning movie series with titles enjoyed by younger viewers. The popular event includes pre-movie games and meet-and-greet sessions with costumed characters. The Lindo in Freeport now has a western movie series. It added pretzels to the menu, in honor of the local high school athletic teams, who go by the same nickname. And that’s the way it’s been for more than three decades. As for Willis Johnson, don’t bother to mention the ‘r’ word. He has no immediate plans to retire, or slow down, for that matter. He’s still having fun, he says, even after all these years. This entry was posted on Monday, January 24th, 2011 at 1:13 pm	and is filed under Arts & Entertainment. You can follow any responses to this entry through the RSS 2.0 feed. Both comments and pings are currently closed.